Beautifully presented detached family home with five double bedrooms and generous reception areas in a popular village location. Close to mainline rail links with a 35 minute commute into London. 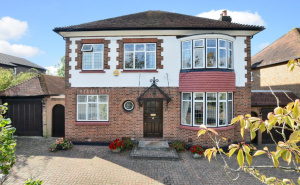 A stunning detached house which is modern and undeniably handsome. Set amongst similar sized houses in a select Carshalton Beeches cul-de-sac which is fast becoming ‘the’ address to possess. With five bedrooms and three bathrooms the houses caters well for the modern family. This substantial period family home offers character throughout with the convenience of modern day living. Benefiting from being lovingly restored by its current owners. This charming property is a rare gem that is set in the heart of the town centre but is merely a few minutes walk from the surrey hills and woodland walks. An exceptional first floor apartment of about 2,292sq ft in a Grade II listed building close to National Trust common land & far reaching views. Set in a secluded development of just four exclusive homes is this last remaining 4 bedroom family home built by award winning Antler Homes. Ready for immediate occupation. Show Home Open, Call For Appointment. A delightful and charming 'Arts and Crafts' style property situated on the south side of Sutton offering access to Sutton town centre and commuter links to the capital. Historical links to artist Graham Sutherland. This extended and well appointed 4/5 bedroom detached property is situated in one of Camberley's most sought after residential locations and offers generous and flexible accommodation. A beautifully presented and extremely well appointed five bedroom family home situated on the edge of this new, highly sought after development, adjoining woodland and surrounded by open countryside. Located at the end of a quiet cul-de-sac setting on the slopes of St. George's Hill is this modern detached family home offering well planned accommodation over two floors. An award winning and stylishly designed five bedroom Linden Homes built house with views and direct access onto Coulsdon Common. A rare opportunity to acquire this four double bedroom detached family home which we understand has been in the same ownership since it was built in the mid-1970s. An attractive and highly desirable 4 bedroom family home in a sought-after road close to Limpsfield High Street.